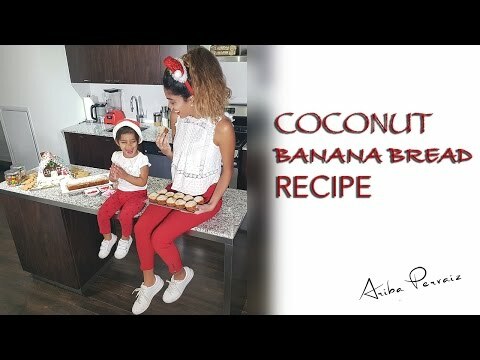 Banana Coconut Bread – Recipe! Anytime Grandma visits Trinidad, she absolutely has to bring me back as much coconut oil her luggage allows. You will find bottles of pure white coconut oil from my kitchen, to baby’s nursery, to my washroom. As you will get to know in a lot of my posts, my uses for coconut oil are endless, and it has found its way into my classic banana bread recipe. The addition of coconut oil, coconut milk, and shredded coconut powder really spikes up the coconut flavor. While perfectly complimenting the naturally sweet taste of the bananas. I’m always secretly happy when I see a pile of overly ripe bananas on my countertop because I love making this bread. It’s perfect the next morning with a cup of coffee for breakfast or an afternoon snack. That is if my husband is kind enough to actually leave some for the next day. I don’t blame him. Resisting the mouth-watering smell of banana bread with a touch of Caribbean is no easy task. Having tried this recipe in endless variations, this one is by far the crowd pleaser. Regular banana bread is definitely a thing of the past! Preheat oven to 350 degrees F. Grease a 9×5 inch loaf pan, set aside. In a medium size bowl or stand alone mixer, stir together the coconut oil, and sugar. Add coconut milk, eggs and vanilla and whisk together. In a separate bowl combine the flour, baking powder, salt, cinnamon, nutmeg and coconut milk powder(optional). Sprinkle the dry ingredients into the wet ingredients, gently mix until smooth. Fold in mashed bananas, walnuts and coconut flakes. Leave some walnuts and shredded coconut aside to sprinkle on top. Spread the batter evenly into the pan and sprinkle with walnuts and shredded coconut. Bake at 350 degrees F for 50-60 minutes, or until a toothpick inserted in the center of the loaf comes out clean. Cool for 10 minutes before transferring the loaf to a cooling rack or platter. Yumm! We have all the ingredients right now, I’m going to try it out this evening! ? ?